On the “Antik Road” in Cappadocia. (1998) A local family cooking flatbread over an outdoor oven in Guzelyurt, Turkey. They shared the bread with us–it was delicious! had once been a Greek monastery, but was now converted to a small hotel with a fantastic chef and the ability to give its guests an authentic taste of life and history in this enchanting region. This area of Turkey is fascinating– so well known for its natural beauty and unusual landscape, as well as its long and illustrious history. In fact, the two things go hand in hand. 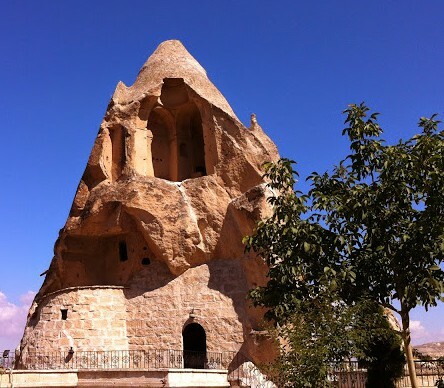 The famous “fairy chimneys” of Cappadocia housed the cave dwellers of the Bronze Age, and later housed early Christian refugees and gave rise to the thousands of cave churches that dot the region. 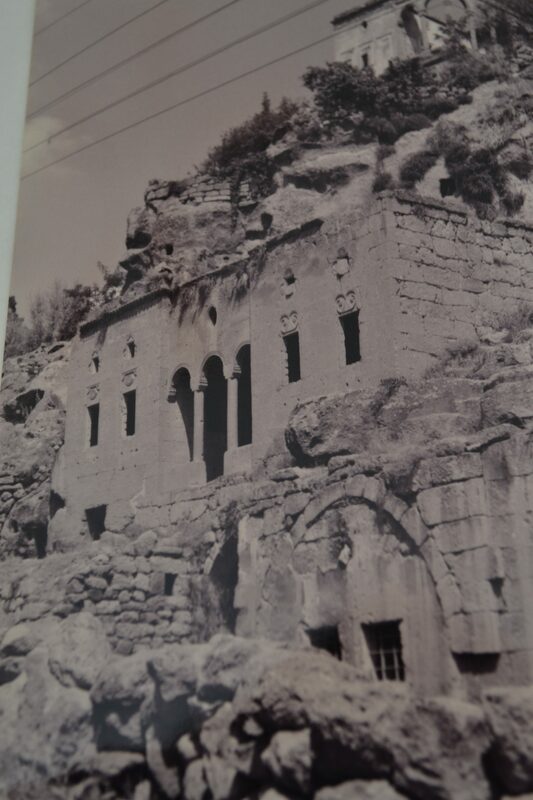 A fuzzy photo from one trip to Cappadocia: at the mouth of a cave church, with dwelling areas above it. 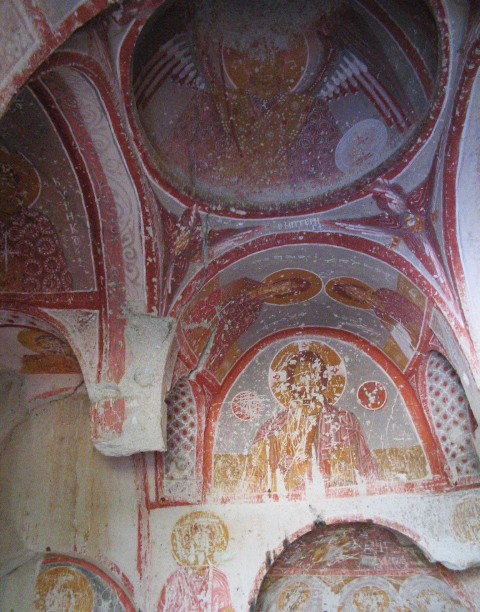 Once inside these churches, you are often met with once-beautiful frescoes that (while still beautiful) are severely weathered by both age and ordeal. Age, because most of the churches here date to between the 6th and 11th centuries; ordeal, as they were intentionally defaced because of religious aniconic sentiments. If the cave dwellings and the colorful history weren’t enough to make Cappadocia a fantastic destination, it has this going for it: it’s no artifact, it’s still living. The potteries of the region are thriving, the people are hospitable, and many locals still live in the hollowed out cave dwellings (and have wired them for electricity!). only to believe that you are passing by empty, ancient buildings (but note the electrical wires that run the length of the road). Then the next thing you stumble upon, two doors down, is the family from the lead photo on this post, huddled in the doorway of another ancient structure and adjoining cave and making their daily flatbread over a simple fire and dome of hot metal. 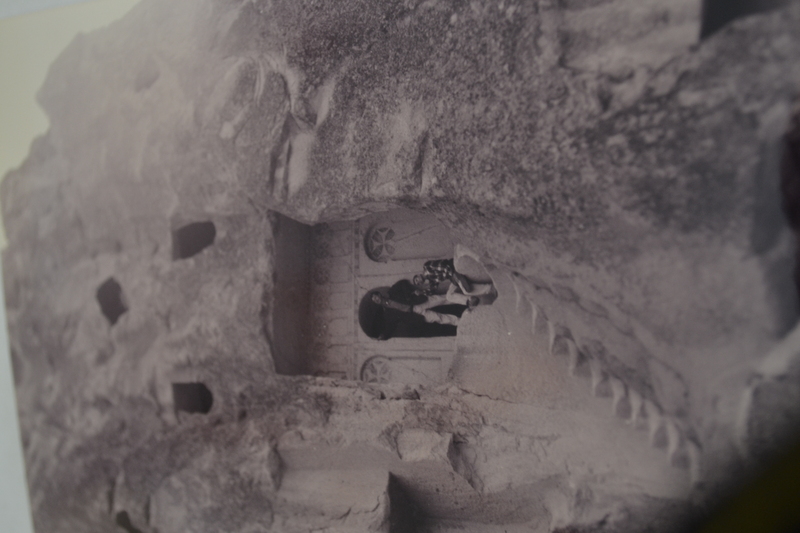 The ancient meets the everyday in the streets and valleys of Cappadocia, the modern meets the miraculous. For my husband and me, who grew up in the tidy convenience of suburban America and were more likely to take dinner from a casserole dish hot out of a Kenmore oven, or even from a drive-through fast food window, this family, hard at work to make their daily bread, kneaded and rolled on a board on the ground and cooked over an open fire on a humble metal dome, this moment was extraordinary. And so very ordinary too. We stopped and spoke to the family. We shared what little language we knew, and they shared some of their bread , warm and crisp from the fire. I don’t think anything has ever been more delicious than those few bites shared on an ancient road. What an incredible way to eat local. Great post. There’s nothing quite like real film photographs, I think it’s funny that so many digital photo filters try to recreate the effects that digital photography was supposed to get rid of! I love the look and feel of old photos too– but I do think that my old black and whites are starting to fade and look even grainier…hope they don’t degrade too much! I think there are places where you can get old photos scanned and turned into digital images, if a home scanner isn’t up to the job. They can also digitalize images from film negatives, which is what I did with my wedding photos. Great post! I like how you combine culture, history and geography with your personal experiences such as breaking bread. Including a map is always a good idea. Thank you! I agree with Peter Klopp that you did this beautifully. And made us stop to remember what a miraculous gift food is … and just a taken-for-granted item you just buy in a shop. This was certainly one of those moments that reminds you and grounds you. Thanks for reading and commenting!